The Professor Layton series follows an English gentleman solving brain teasers and occult mysteries with his apprentice Luke. The Ace Attorney series follows lawyer Phoenix Wright as he breaks down the logical flaws in witnesses' testimonies to protect his clients and uncover the truth in a court of law. At first glance they might not seem all that similar. But upon closer inspection, they both revolve around one simple concept: challenging your very ability to think. And it is this very reason that Professor Layton vs. Ace Attorney is one of the best crossover games ever made. The most obvious potential problem when combining Ace Attorney and Professor Layton is the setting. Ace Attorney takes place almost exclusively at the crime scene or in a courtroom. Layton, on the other hand, often takes place in various isolated and mystical locations. Yet, Professor Layton vs. Ace Attorney overcomes this potential obstacle by picking the perfect setting for both: a witch trial in a self-contained (and quite literal) storybook world. Thus when it comes time to gather evidence, Layton and Luke are free to wander around the city contained inside the book, doing puzzles and solving mysteries. Then when it's time for the trial, Phoenix and Maya can use the collected evidence and revelations to protect their accused client in the medieval courtroom setting. In other words, it is a game that perfectly manages to combine the spirit of both parent series. Mahone who has been accused of being a witch. The villain in the story is actually the "Storyteller," the writer of the book they are in. The Storyteller quite literally controls the fate of all those inside the book. Even those coming from the outside can be influenced to some degree by what he writes once in his world. So in reality, this game isn't really Phoenix versus Layton, it's much more along the lines of "Phoenix Wright and Professor Layton vs. God." Of course, given the enemies the two of them have faced in their respective series, this "god" might need to ask them for a handicap. The gameplay style of the Professor Layton section is virtually unchanged from the games in the main series. But the Ace Attorney parts of the game now include multiple witness testimony and a spell book (for reference), among several other changes. While I have only played the first two Layton games and can't make an across-the-board comparison, I found the puzzles in Professor Layton vs. Ace Attorney to be quite good in general as they almost always seem to have a well implemented visual component ranging from picture matching to mazes. The witch trials, on the other hand, are often on par with the best courtroom scenes the Ace Attorney series has to offer. This comes largely from the handicaps facing Phoenix. He is in a world where he is ignorant of the local laws and customs—not to mention the actual physical laws of a world where magic exists. Moreover, this reality is akin to a medieval fantasy. Thus, the majority of forensic science is non-existent—forcing him to rely on critical thinking more than ever before. 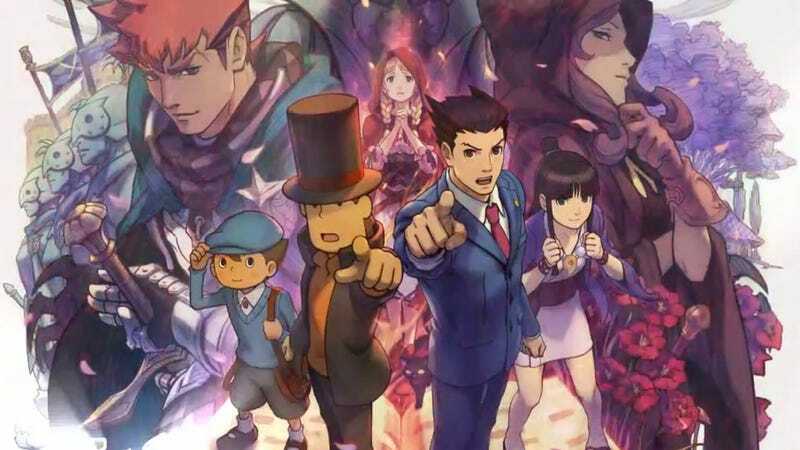 While the Professor Layton games have had voice acting sprinkled through their narratives from the beginning (not to mention an animated feature film), the Ace Attorney games have always been voice free (other than the lawyers' shouted commands of "objection!" "hold it!" and "take that!"). Thus Professor Layton vs. Ace Attorney is the first time gamers will get to hear Phoenix and Maya speak. In the Japanese version, they are voiced by Hiroki Narimiya and Mirei Kiritani, reprising their roles as Phoenix and Maya from this year's Ace Attorney live action film which makes for a great sense of continuity. While nowhere near every line is voiced, the climactic (or fan service-filled) moments in each chapter are voiced. There are also more than a few anime cutscenes where the animation is easily on par with Professor Layton and the Eternal Diva. The only odd thing about the visual presentation is that the Layton characters and Ace Attorney characters retain their original character designs from their respective series. But while the two styles do clash a bit at first glance, within a few minutes of playing you won't notice. If the game has any one potential problem, it's how long it is. The game is separated into twelve chapters—six for Phoenix and six for Layton—which each take two to three hours to complete. Thus this is easily a 30-plus hour game—and that's assuming you don't get stuck. On one hand, that means it really is as long as a Layton game and an Ace Attorney game put together; so you have an epically long adventure. On the other, it means that if you only care about one of the principal leads, you'll have to slog through an entire game's worth of "irrelevant" content to see the resolution of the story. In Japanese gaming, major company crossovers are nothing new. But Professor Layton vs. Ace Attorney is far more than a simple character crossover. It is a true combination of two games—not only in characters but also in gameplay and tone. If you are a fan of both the Professor Layton and Ace Attorney series, this game may live up to even your wildest expectations. But even if you only like one of the parent series, this game is still worth a play. In the end, it really is a strong entry into both series. Professor Layton VS Ace Attorney was released in Japan on November 29, 2012, for the 3DS in Japan. There has yet to be an announcement one way or the other in regard to an international release.